Far from shutting up shop and hurrying show-goers out the gates when the sun sets, night time is when the party really gets going at the Ekka! Famous for its stomach-flipping rides, super-sweet treats (who says you can’t tuck into a famous strawberry sundae by night? 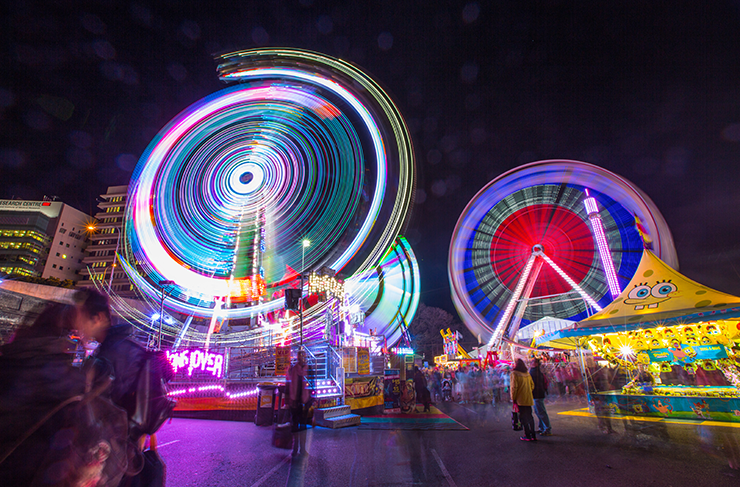 ), and death-defying stunts, the Ekka by night is some of the best fun you’ll have all year! We’ve rounded up our top picks of late night entertainment at this year’s Ekka, for the big kid in all of us! Roll up, roll up, no Ekka trip is complete without an evening spent in Sideshow Alley! From heart-stopping rides (Ekka goers with a fear of heights should stick to the dancing teacups! ), to traditional fun fair attractions for kids big and small, make sure to ride the famous Ferris Wheel, then tuck in to a dagwood dog and some fairy floss for a night well spent! 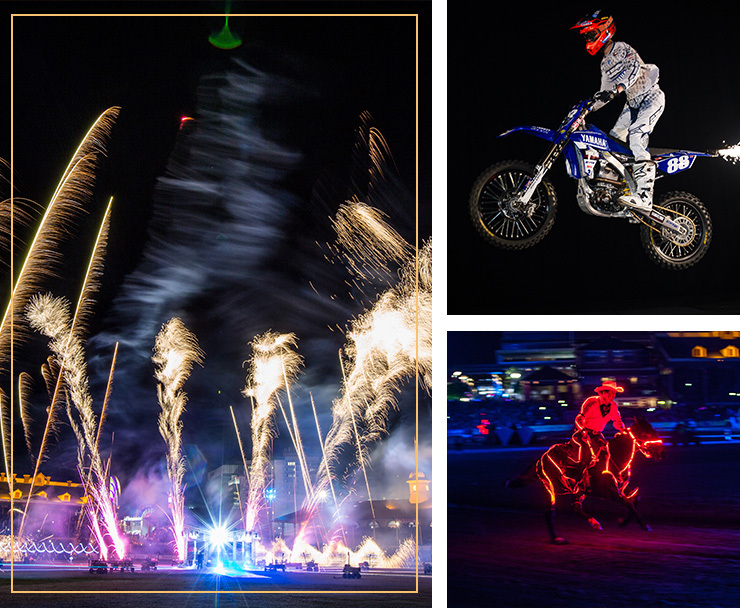 EkkaNITES is jam-packed with new entertainment for 2016; a mind-blowing show of lights, music, stunts, fireworks and a few surprises to really get the blood flowing! From the FMX daredevils, to a herd of illuminated galloping horses, EkkaNITES is a must-see for the seasoned and newbie Ekka goers alike. Set to rip up the arena for another year, rev heads and speed fiends alike will relish the speed of the annual Hot Wheels time trial! It’s boys versus girls in this thrilling show of equal parts skill, speed (and insanity! ), and with the giant Hot Wheels Stadium Truck sure to get some air-time around the track, this is a must-do on the Ekka calendar. Those looking for a change of pace (the kind that involves limited movement and much food guzzling) need to come to the inaugural ‘Dinner With Dom’ at the Royal Queensland Food and Wine Show Cooking Stage; a sit down dinner prepared in front of diners by celebrity chef, Dominique Rizzo! Ask questions, soak in some priceless cooking tips, and enjoy a delicious dinner showcasing some of Australia’s finest produce. For all of you wannabe jackaroos and bush wranglers, join bush heroes Stockman Dave Manchon and American Cowboy Anthony Lucia in a performance for all the family! With incredible stunts by man and cattle, join in an evening of heritage fun, with a dose of Aussie humour! Every night from 5pm, the Main Arena comes alive with Australian tradition—Ekka style! Watch on as champion axe-men compete in the Woodchop Championship, cheer on man and horse in the craziest time trials ever at Ride and Drive, and be enthralled by the much-loved Sheep Dog Trial demonstrations. There really is something for everyone. The Ekka would not be the complete without the infamous Spectacular Fireworks Finale! A breathtaking show every year, 2016 is set to be the biggest yet! From fireballs to beautiful fireworks lighting up the night sky, even LED horses (!) Brisbane will be lit up with colour and a tonne of energy.